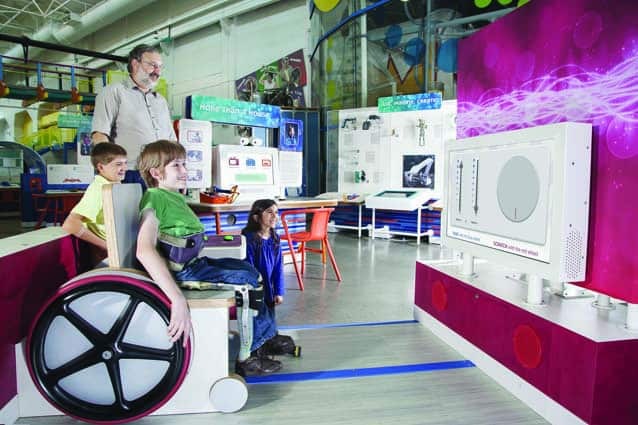 Visitors are encouraged to go hands-on at Montshire Museum of Science, like trying out a DJ music remix station built out of a wheelchair and controlled by the wheels. NORWICH — What do you get when cutting-edge science and engineering join forces to assist the human body? Endless possibilities for improving day-to-day lives and realizing lifelong dreams! Explore “Human Plus: Real Lives + Real Engineering” at the Montshire Museum of Science in Norwich, that began in January, and runs through May 8. The exhibition offers visitors of all ages the chance to explore engineering concepts and to create a range of low- and high-tech tools that extend the potential of the human body. Funded by the National Science Foundation, Human Plus showcases compelling stories from a unique field of engineering that uses science, technology, and creativity to overcome limitations and unlock every person’s potential. Throughout the exhibit, Montshire visitors will be able get their hands on a broad range of actual ability-enhancing tools. Exhibits include: a neuroprosthetic limb that can be controlled by a person’s thoughts; a virtual downhill mono-ski course; a DJ music remix station built out of a wheelchair and controlled by the wheels; a touch panel that translates songs into vibrations so visitors can feel the music; and a hands-free computer mouse, controlled through head movements, that allows a visitor to the exhibition to type messages and edit photos. Visitors can even redesign themselves in a full-body simulation and test body-enhancement technologies that supersize their strength, showcasing the new horizon of engineering that was once the stuff of science fiction. The engineering process always begins by asking the user what they want to achieve. The exhibition poses design challenges from real-life users, such as: Can you make a tool to help someone in a wheelchair feed a pet? Or a tool that overcomes visual impairments and locates hard-to-detect obstacles? How can you design a canoe and paddles for people without arms? After viewing some of the amazing technology developed by today’s engineers, visitors will be able to put their own creativity to the test as they build and try out their own inventions. From busy moms and engineers, to adventurers and dance performers: people who use these new technologies—as well as the innovators themselves—share their stories through videos as well as the real-life tools they use every day. Whether they are about caring for three children or about reaching the summit of Mt. Everest, these stories captivate audiences. “Human Plus” opened Jan. 30 and runs through May 8. Accompanying the Human Plus exhibition, Montshire Museum of Science will host four evening programs, “+TALKS,” that will examine the complexities of the human body and how we can support it through engineering and community wellbeing. The Montshire Museum of Science in Norwich is a hands-on interactive science center with more than 125 exhibits on nature, technology, astronomy, and the physical sciences. Visiting exhibitions, educational programs, and special events are offered throughout the year. It is open daily from 10 a.m. to 5 p.m. (closed Thanksgiving and Christmas). For more info, visit montshire.org.